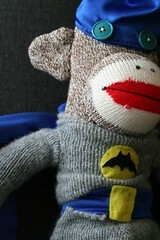 I watched The Dark Knight last night after the girls had gone to bed. Emily made a play to try to stay up and watch it with me, but as a responsible parent, I wasn't going to allow it. It's not just that it's violent and scary, but it's also far too complex a movie for a four-year-old to comprehend. In the morning though, it because obvious that she wasn't going to let this go. Immediately upon waking up, she came into my bedroom and began talking to me about Batman. "Sometimes at Mimi's house we watch cartoons, and the other day I watched a Batman cartoon," she told me. "There were all these monkeys, and they were green, and Batman told his friend not to eat all the money, but he did it anyway."